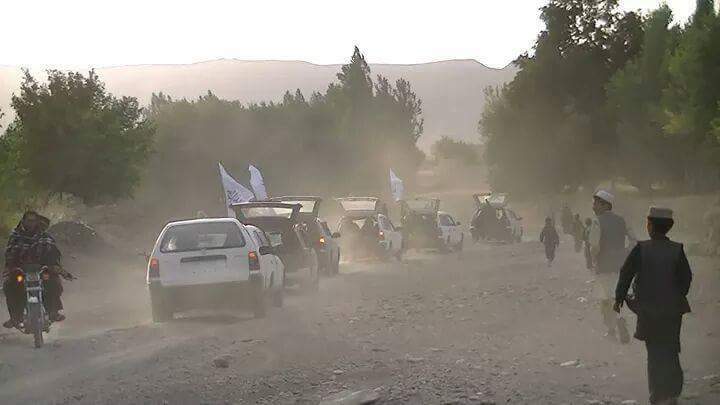 TAKHAR, Sep. 29 – The Islamic Emirate’s Mujahideen gained control Bangi district of northern Takhar province following the seizure of Ishkamish district early this morning amid intense fighting that forced the enemy to retreat with fatal losses, Al-Emarah News reports. Early this morning Mujahideen stormed the Bangi district and seized the district’s administration buildings. With the district fallen, the enemy ran away leaving vehicles filled with arms and ammo behind as Mujahideen intercepted them. This came as Mujahideen seized control of Kunduz city with police headquarters and all the military and government installations followed by capture of 12 combat posts in Chahar Darah and 14 others along the road between Kunduz and Khanabad which led to the conquest of Ishkamish district of Takhar province. According to recent reports, Khanabad district is said to be under Mujahideen siege where heavy fighting is well underway. Meantime, Mujahideen captured a huge military base and another 6 outposts within the limits of Kunduz city, taking the number of the military installations seized by Mujahideen to over 27 till late yesterday night. Furthermore, a large number of the enemy top and low-level personnel has been cornered by Mujahideen in airbase since Kunduz airport was under Mujahideen siege.